Blacksburg, Va., Feb. 25 – Owens Hall: Owens dining hall is home to 12 specialty shops serving both American and international cuisine. When it comes to fending off the “freshman 15,” students at Virginia Tech have to fight some serious temptations. While the nationally ranked dining halls do their best to advertise their healthy options, it is easy to fall victim to their gourmet desserts and garlic whipped mashed potatoes. Virginia Tech senior Sarah Pierce believes the reason that students struggle to opt for healthy food choices is not because the university doesn’t provide them, but because students are usually pressed for time. As a college student constantly on the move, fast meals or grab-and-go options can be more appealing. The university’s You’re Eating Smarter (Y.E.S.) program works to design menus that offer fruits and vegetables, low-fat dairy options, whole grains and proteins. According to Virginia Tech’s website, the Y.E.S. program responded to student requests for healthier grab-and-go items with the creation of the Y.E.S. to Go. In addition to creating and providing a variety of wholesome meals, the Y.E.S. program seeks to educate students about how to make smart choices. While Y.E.S provides nutritional facts and information online and on table cards throughout the dining centers, their efforts to reach students may not be enough. To help guide students even further, the Y.E.S. program has blog outlining how to be a “healthier Hokie.” A cheat sheet that outlines the best options for a balanced diet at each shop in every dining hall on campus is listed on the site. For additional assistance on staying healthy, Y.E.S. hosts nutrition education events at dining halls and encourages students to reach out directly to dining service’s dietitians. Although the cheesecakes and cannoli may look tempting, for Virginia Tech students saying Y.E.S. is the key to looking and feeling your best. Blacksburg, Va., Feb. 25 – Grab-and-Go Options: The Y.E.S. 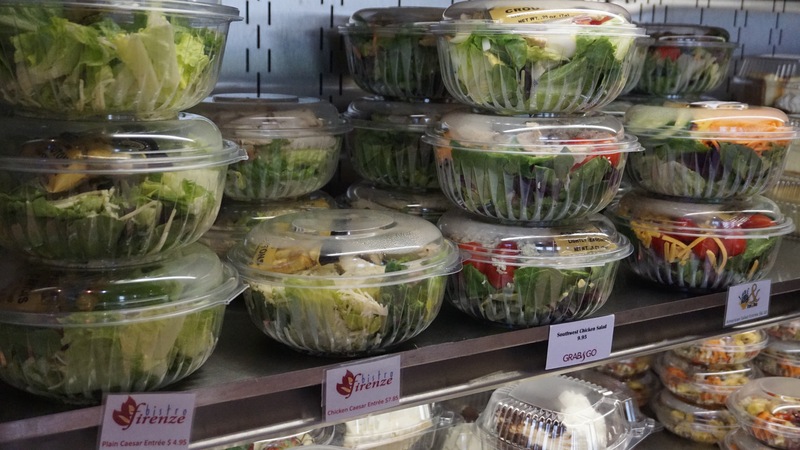 to Go program provides a variety of salad entrees for students in the grab-and-go sections of the dining halls. 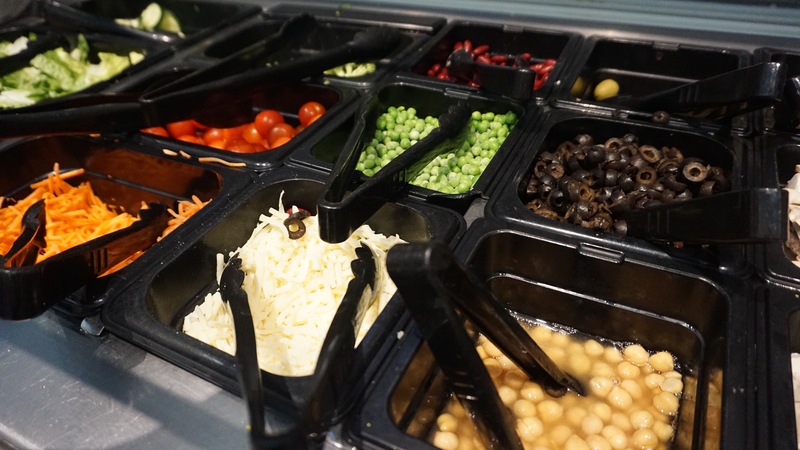 Blacksburg, Va., Feb. 25 – Toppings Bar: Owens dining hall gives students the opportunity to build their own salad with a wide selection of toppings and dressings. 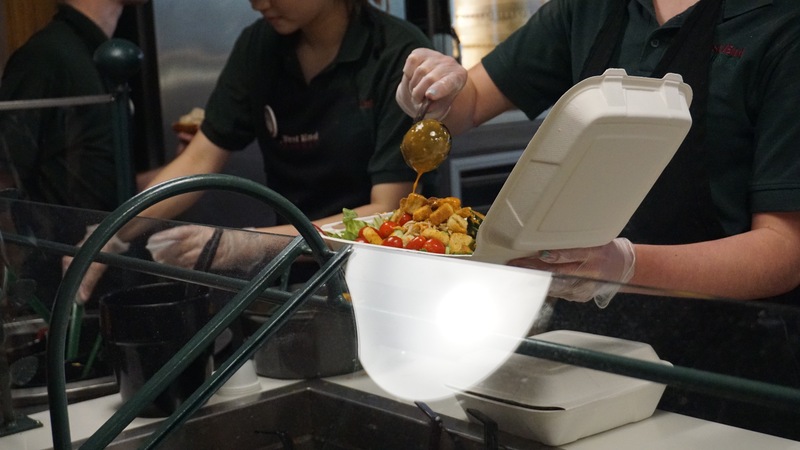 Blacksburg, Va., Feb. 25 – Salad To-Go: A student gets salad dressing added to her West End Market salad. The salad is prepared in a to-go box. 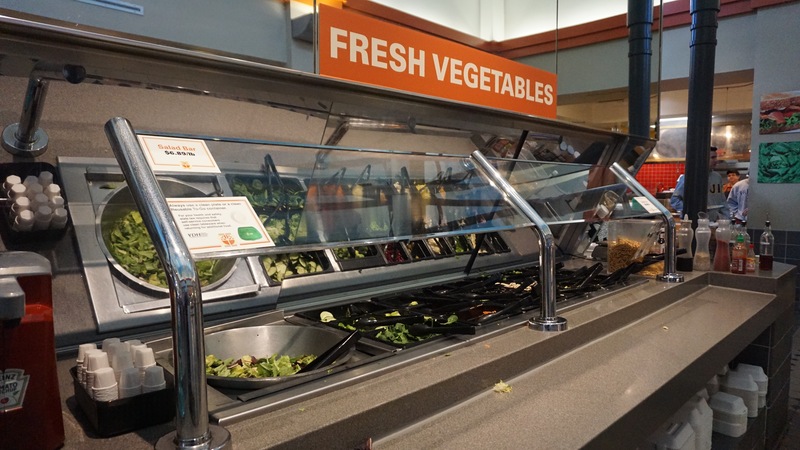 Blacksburg, Va., Feb. 25 – Fresh Veggies: Owens dining hall offers fresh vegetables and fruits for students. 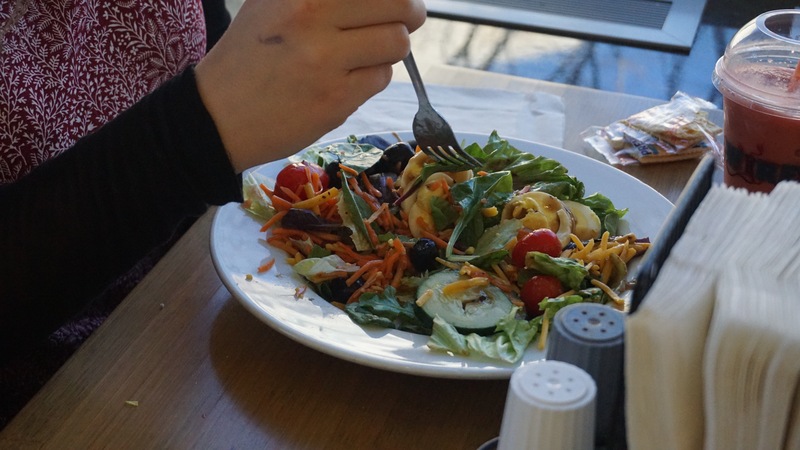 Blacksburg, Va., Feb. 25 – Dig In: A student takes a bite of her All American salad in West End Market. 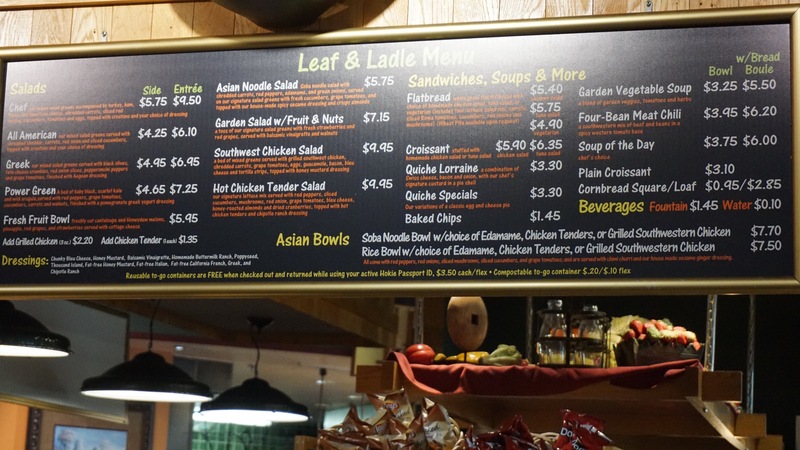 Blacksburg, Va., Feb. 25 – Dining Hall Menus: West End Market’s Leaf and Ladle menu represents what a general menu in a Virginia Tech dining hall looks like. Menu items and prices are listed but calories are not. 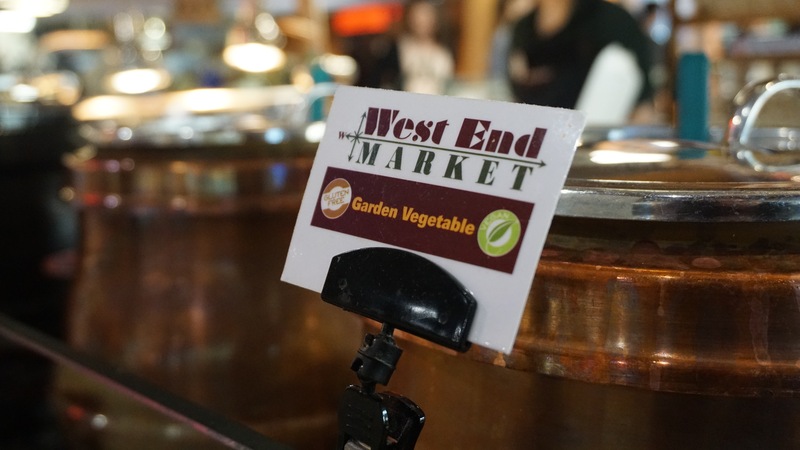 Blacksburg, Va., Feb. 25 – Soup of the Day: West End Market offers vegetable soup and chili daily at its salad station. 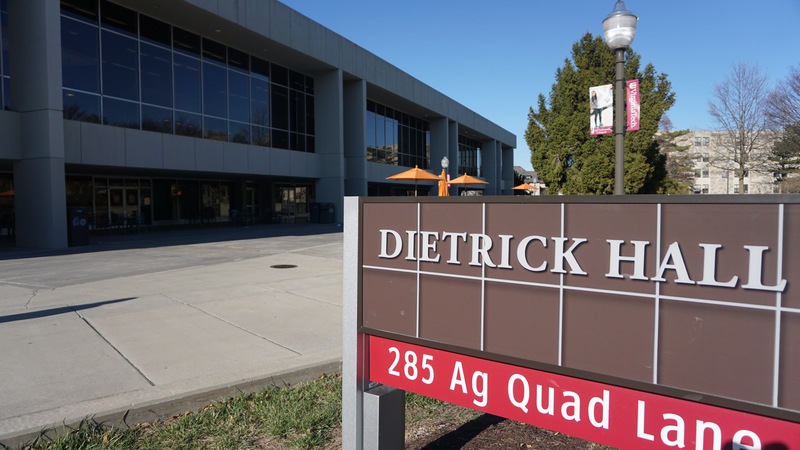 Blacksburg, Va., Feb. 25 – Dietrick Hall: Dietrick dining hall offers international cuisine on its upper level and gourmet desserts and express items on its lower level. 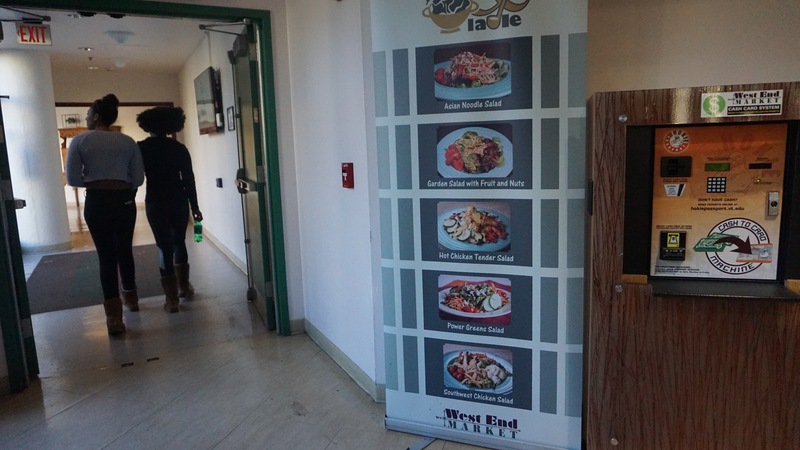 Blacksburg, Va., Feb. 25 – Specialty Salads: West End Market advertises their salads using posters and banners throughout the dining hall.